The resort’s dining options include the airy Pavilion Restaurant, which opens early for an international buffet breakfast and serves a tempting à la carte menu each evening. In the casual Fairways Café, you can enjoy coffee and light meals on the terrace. Next door in the 19th Hole, savour a drink after a round on the resort’s course or neighbouring Wairakei International Golf Course. In the evening, the welcoming Geyser House Bar is the place to indulge in cocktails and fine wines. The resort dates from the late 19th century when travellers were drawn to the region by its therapeutic hot springs and dramatic scenery. A short hike takes you to the geothermal pools that power the hotel, while many of the rooms, suites and villas offer panoramic views of Wairakei Tourist Park. A few minutes’ drive away, the Waikato River flows out of expansive Lake Taupo, creating the dramatic Huka Falls when it narrows to thunder through a 15-metre-wide canyon. The resort is ideal for business or leisure. High-speed WiFi is available throughout, and all guests receive 500 megabytes per day free of charge. Function facilities can cater for intimate board meetings or conferences for up to 600 people. Three main rooms with presentation equipment are complemented by outdoor spaces in our extensive landscaped gardens. Ample complimentary parking is available. 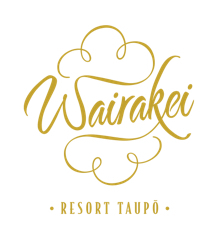 In addition to sightseeing, outdoor activities include mountain biking on the resort’s tracks, kayaking, fishing and water-skiing at Lake Taupo, and golf at 6 courses, all of which are within 40 minutes’ drive of the resort. The more adventurous could even try bungee jumping, sky diving, skiing or car racing. After a full day in the great outdoors, why not re-energise with a workout in the hotel’s well-equipped gym, a few laps in one of our 2 outdoor pools, or an invigorating session in the hot tub? The resort boasts a Muslim-friendly status with the Holy Quran, prayer mats, ablution facilities and prayer rooms available upon request. Muslim-friendly meals can also be arranged for advance group bookings.